Smoke from wildfires up north caused a gray haze to sink over the fields and pastures of my grandparents' farm. Dark blue rain clouds slowly gathered on the edge of the horizon during the afternoon of tractor repairs and garden surveying. When the wind grew stale and the air pressure dropped, we brushed the dust off the bottoms of our jeans and headed indoors. We gathered around the dining room table as we always do; it's the heart of the home. My grandfather opened the windows to let in the rapidly cooling air, turning on a fan to circulate the air through the old farmhouse. My grandmother settled over the stove, frying up sausages for an early dinner. My father opened the newspaper, the room filling with the periodic sound of his page turning. I shuffled through a deck of cards, laying out a new game of solitaire. We lived in this comfortable silence, taking in the earthly scent of the downpour and the browning of the meat in alternating breaths. This moment embodied the slow living of country life; no television or radio in the background, no electronics to take us away from the reality of moment. Instead, we listened to the music of 4:30 pm—the sound of a lid arranged on a pot, of rain hitting the windowpane, of the eight of clubs placed on the nine of hearts. I wish I could put this song on repeat. In the heat of the summer, it would be a shame to ignore the abundance of fresh, in season fruit. I have embraced the fruit perhaps too much; my kitchen is currently stocked with a mixture of honeydew, watermelon, peaches, strawberries, blueberries, dark cherries, and plums. In attempts to use up the fruit before it expires, I have baked them into cakes and crumbles (and eaten it straight with a fork). My favorite iteration so far are these dark cherry hand pies. While full-sized pies are both stunning and delicious, this season calls for more convenient fare. Hand pies require no knives, forks, or messy plates, making them ideal to serve at parties, picnics, and afternoon snacks. 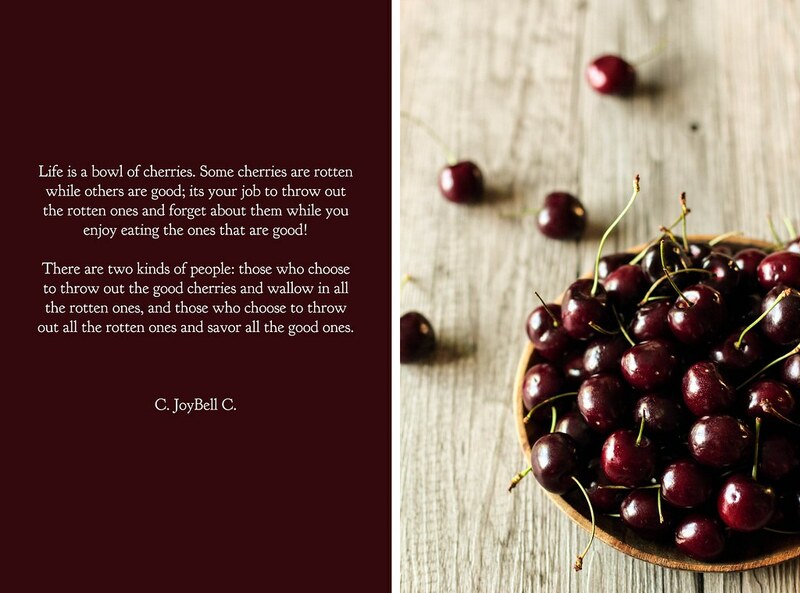 Dark cherries are so sweet and ripe this time of year; I recommend buying a pound to eat and a pound to bake. Cherry Hand Pies are a sweet, well portioned dessert to bring to events to share. The dark cherries are complemented by a touch of cinnamon and a spoonful of lemon juice, which bring a strong, balanced flavor to the bite-sized pastries. 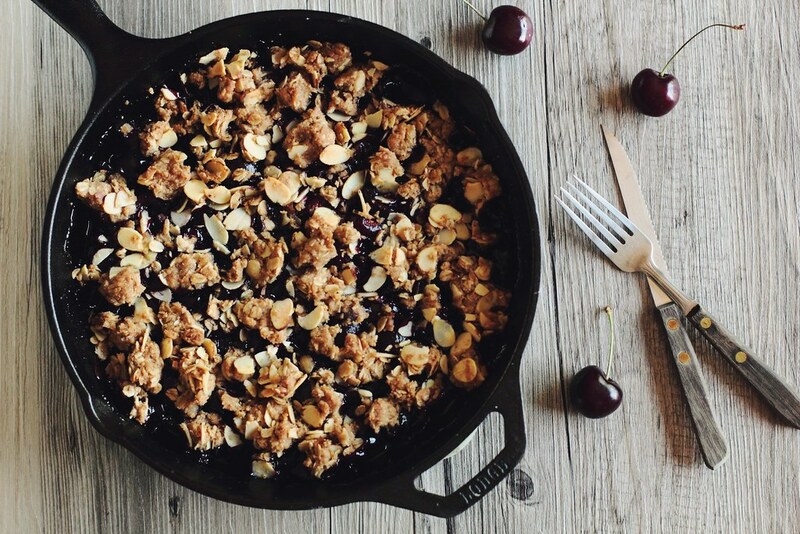 As a note, if you choose to use sour cherries in this recipe, you will need to add more sugar. Taste the filling as you go for best results. In a large mixing bowl, gently stir together the pitted and quartered cherries, sugar, flour, lemon juice, and cinnamon until the cherries are evenly coated. Set aside. On a lightly floured surface, roll out half of the dough into an 11 by 16-inch rectangle between 1/4 and 1/8-inch thick. Using a pizza cutter (and a ruler to guide) cut out 5-inch squares. You should get six squares. Use leftover dough to fill in areas where the dough tears or more dough is needed near an edge. Place a spoonful of cherry filling in the center of each square. Avoid overfilling the squares or they will not seal properly. Using a finger, brush water around the dough square to help seal in the fruit. Fold over the dough to form a triangle (keep the nicest edge on the top of the fold for best appearance) and use a fork to press down the edges. Brush each square with milk and sprinkle on granulated sugar for additional sweetness. Use a knife to cut several steam holes in the top of each pie. Repeat process for second half of the pie dough. Bake the hand pies for 35-40 minutes, or until fruit is steaming and pastry is browned. If the crust browns too quickly, cover the edges of each pie (or the entire pan) with aluminum foil to prevent further browning. This will likely only occur with all-shortening pie dough. As I walked into my apartment late last night, kicking off my shoes and tossing my keys on the kitchen counter, I asked my boyfriend to step out on the balcony and smell the air. Though an odd request, he did as I asked, moving the window blinds aside and sliding the door open. After taking in several breaths of the air, he turned around to look at me with a puzzled expression across his face. It just smells like night, he said. Exactly, I told him. It smells like night. When dusk falls, the air takes on a new scent. While the aromas of the day are subdued, drowned out by heat and car exhaust, the disappearance of the sun pulls out the scents hidden deep within the earth. Night air has an undeniable sweetness, as if a thousand quiet flower blossoms are blooming at once. The smell is earthy, the dirt kicked up during the day finally settling back to solid ground. Once the humidity of the day begins to wane, the dampness of the air holds the aromas in place, helping them grow stronger as the dew settles onto the leaves in the trees. When I walk through the grass, looking up at the starry sky above me, I wonder if the stars rain their own fragrance down from the heavens. Growing up in a state marked by pastures and endless blue skies, the unique scent accompanying the night was something I took for granted. Perhaps it wasn't until that late night walk into my apartment that it dawned on me that it was something to appreciate. The light breeze keeps the aromas of night unspoiled—never to grow old, always to remain familiar. I wonder if the night carries its own scent elsewhere, in cities big and small. I wonder if it has the same sweetness, the same feeling of grass underneath your bare feet and dirt beneath your fingernails. I wonder if I am the lucky one. As I sit out of my porch with twilight long past, the darkness of the sky pure and unyielding, I breath in the night and hold it in my lungs until my chest aches. I know I am the lucky one. 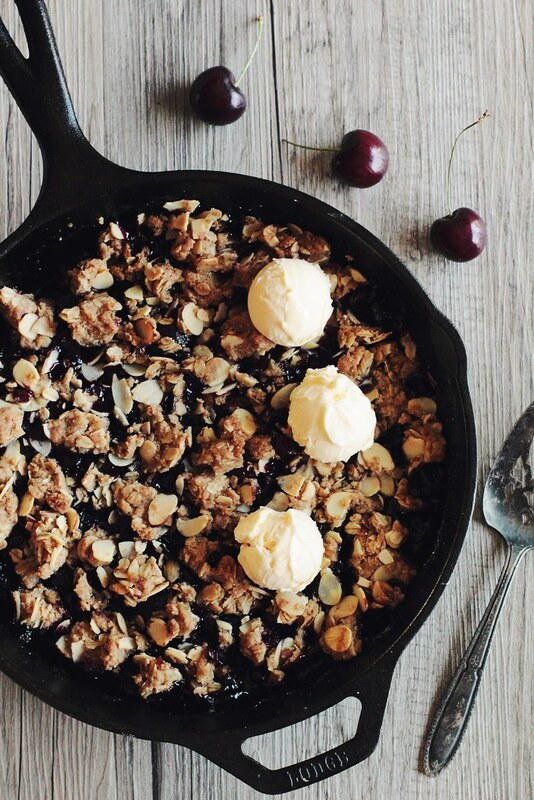 Cherry Almond Crumble has a flavor as pure as the night air. 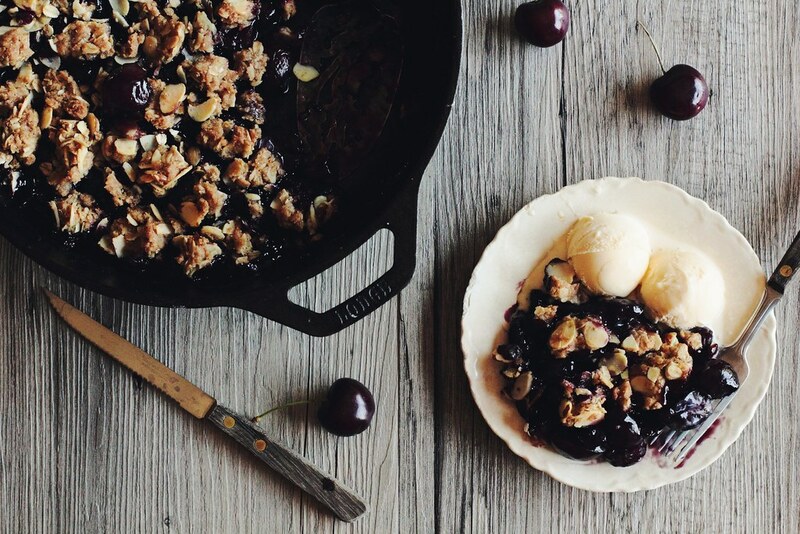 Dark sweet cherries are mixed with a little brown sugar and baked until bubbly and fragrant. A dough of cinnamon, oats, and almonds is sprinkled over the top and continues baking until golden. 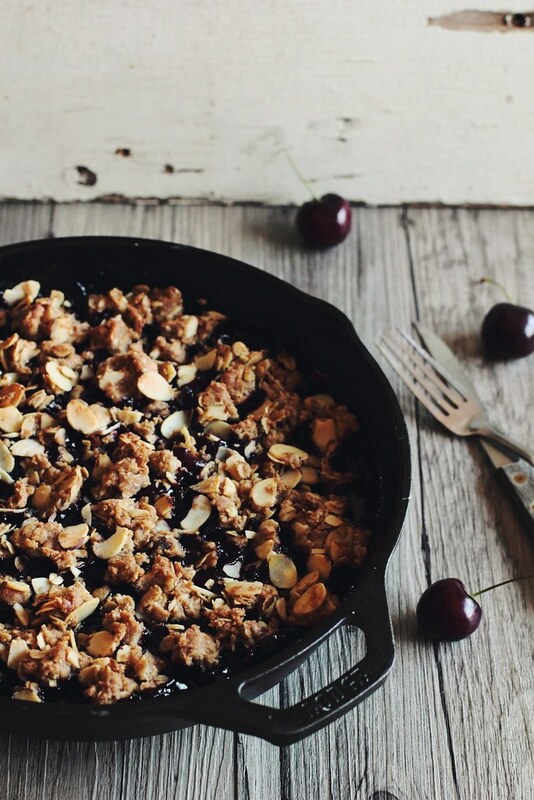 The fruit crumble allows the simplicity and sweetness of the fresh cherries to shine, the other components deepen and support the bright flavor. 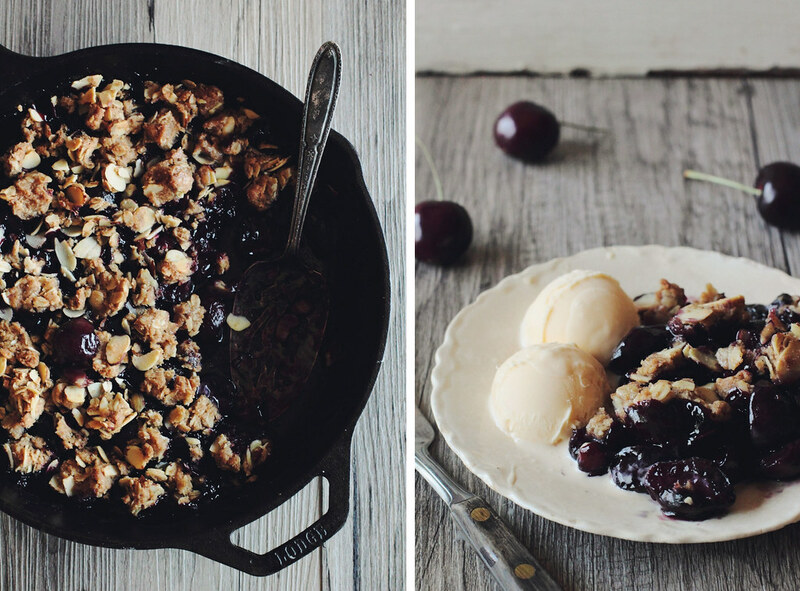 This crumble is a celebration of summer fruits and long summer nights.